For anyone suspecting that they are a victim of predatory lending, contact the mortgage fraud attorney at Consumer Action Law Group. Their mortgage attorneys are dedicated to filing predatory lending lawsuits. Predatory lending is still common practice for many lenders and loan servicers. Consumer Action Law Group has many years of experience fighting mortgage lender fraud and illegal practices and saving homes; their mortgage attorneys can easily identify signs of predatory lending and advise when to sue a lender for loan modification fraud. • Dual tracking: It is illegal when a lender moves forward with a foreclosure at the same time the lender is reviewing a borrower for a modification. Any foreclosure activity must be suspended while a lender is offering foreclosure relief. • Wrongful Denial of loan modification: It is illegal for a lender to deny an application for a modification without a written explanation and a 30 day opportunity to appeal. • Misrepresentation: It is illegal for a lender to make and break promises to a borrower or to make statements that are false. Many borrowers are told that they do not qualify for a modification or that their documents were not received in time or at all. • Negligence: It is illegal for a lender to “lose” documents or to claim that they did not receive documents “prior to the deadline” when a borrower has sent the requested documents many times, with proof of mailing / faxing / e-mailing. • Single point of contact: It is illegal for a lender to pass a borrower from one person to another without providing a designated contact for the lender to assist the borrower. The designated representative for the lender must provide their contact information including e-mail address and phone extension. All correspondence between a borrower and lender should be in writing. • Prior Modification cancelled: It is illegal for a lender to cancel a prior modification without cause. In general, a modification is a binding contract and must be enforced. • Transfer to new loan servicer: It is illegal for a new loan servicer to reject the terms and payments after a transfer of a loan or a modification from a prior lender or loan servicer. In simple terms, a contract is still valid and must be enforced after it is transferred from one lender to another. 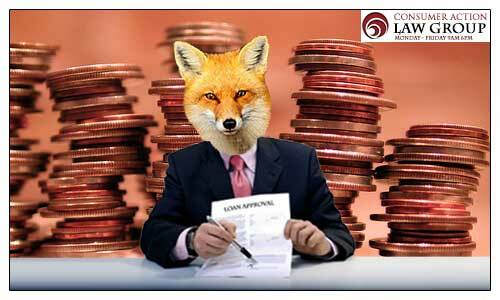 • Change in terms of modification: It is illegal for a lender or loan servicer to change the terms of a modification. A change of terms is a breach of contract. • It may be illegal if a borrower is required to pay a fee for paying off the previous loan. • It may be illegal if a borrower is required to pay a fee for obtaining a modification. For anyone who is unsure about a loan modification that they have received, or for anyone who has been denied after applying, it is best to contact Consumer Action Law Group and talk to their mortgage fraud attorneys for assistance. Predatory lending is illegal and can be stopped. Call Consumer Action Law Group if any of the signs are present. Know what the signs of predatory lending are before ending up in a situation that is dangerous or volatile, or one that can lead to foreclosure.